I should preface this report by saying that I have nothing against Bournemouth, other than the fact that it offers a safe refuge for Harry Redknapp. The beaches are nice, it’s got a record shop and a cat cafe. What more could you want, except a rivalry with a team that’s miles away and isn’t that upset by your success? Anyway, I’ll move onto the game itself. So that’s how it feels when you win at home. Well I never - I had forgotten what it’s like to see Saints win a match at St Mary’s. Judging by their reactions at the end, the players had too, so hopefully they can start to make a habit of this again. After what’s been an arduous season, finally we saw a game that reminded us why we bother going to football in the first place. At several points during the game it felt like Saints might throw it away despite their overall superiority, but they managed to hang on for grim death near the end and kickstarted their survival campaign at the same time. This is what we had been missing for most of the season: enough good performances from the likes of McCarthy, Yoshida, Lemina, Romeu and Tadić to make up for the indifferent ones (Cédric, Bertrand, Redmond, Austin, Long). I have left Hoedt off the list, as I still can’t tell if he played well or not: his mixed contribution was summed up when he played the ball straight to the opposition in the Bournemouth half, charged back and made a last ditch tackle as Bournemouth were breaking on goal. Saints were by far the better side in the first half and could consider themselves unlucky to have gone in at half-time at 1-1. As usual, they failed to take advantage of some promising opportunities and should have gone in to the break ahead by at least a couple of goals. Saints started off playing a long ball game without much success. Austin was winning nothing in the air and was looking isolated, as whoever has been playing up front has done all season. As the half went on, Saints showed some neat passing between defence and midfield, but ran out of ideas when they realised that Austin couldn’t offer much (if any) movement up front. 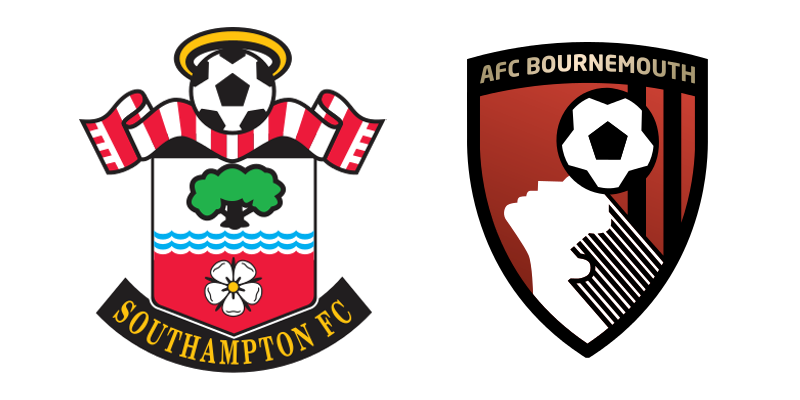 It was only when Saints managed to catch Bournemouth on the break from a corner, that they scored the game’s first goal. The much-maligned Redmond nicked the ball, Lemina broke at pace, drew Charlie Daniels and then slipped a perfectly-times pass through to Tadić, who made the finish look easy. The Bournemouth fans started to droop after the goal, but by half-time they were chanting “Oh When The Saints...go Championship!” (needs work), after Saints left Josh King unmarked at the far post and he put it away from close range. The Saints players looked shell-shocked as the goal went in, just as the announcer was calling three minutes of added time. I suspect Pellegrino’s Saints would have folded at this point, but Mark Hughes seems at least to have transplanted some backbone into the team. Dropping leads against Arsenal and Chelsea was disappointing at the time, but those games against superior opposition could be considered with hindsight, as training sessions for this one, as they helped Saints to raise their playing level when it really mattered. In the second half I lost count of the number of times Saints’ defenders and midfielders stepped up to intercept forward passes from Bournemouth. Saints didn’t really capitalise on regaining possession, but at least they were effective in stifling Bournemouth, who were breaking at pace and looking threatening at times. Fortunately, their late pressure came to nothing as McCarthy showed what a difference a confident keeper can make when called upon. Andrew “Saints” Surman came on as a substitute, but there was no way he was going to spoil the party. “We want our money back!” chorused the Northam during the game but we should consider the debt paid after this result.